We were headed to the pool. Finally. Ray had spent the entire summer trying to convince me to walk in that direction. But after the first two times of falling for it and spending at least fifteen minutes trying to convince the passively resistant Gandhi-dog that he couldn't go swimming with all the kids, I had found alternate walking routes. 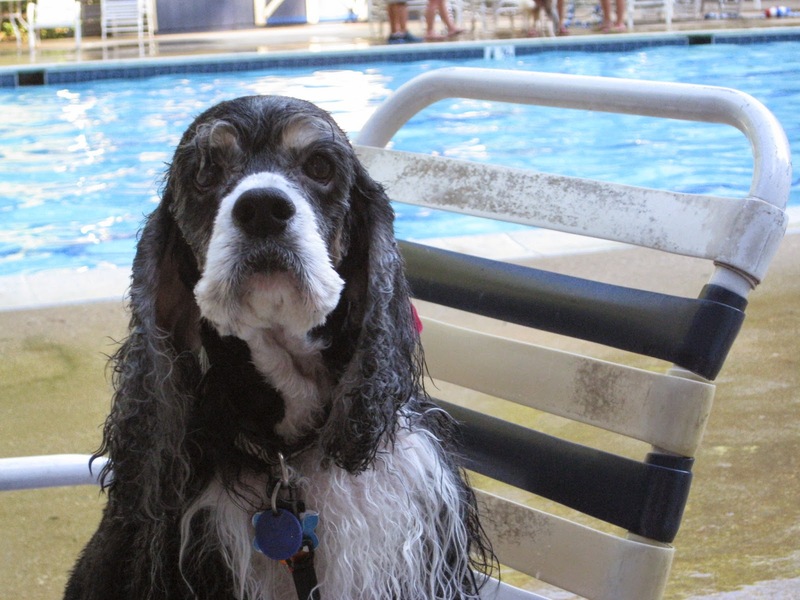 Even so, sometimes when we would walk around the block, Ray would get to the corner closest to the pool, stop, and leeeean into his harness sideways with a backward look over his shoulder that said louder-than-a-kid's plea "pleeeeeze can we go?" 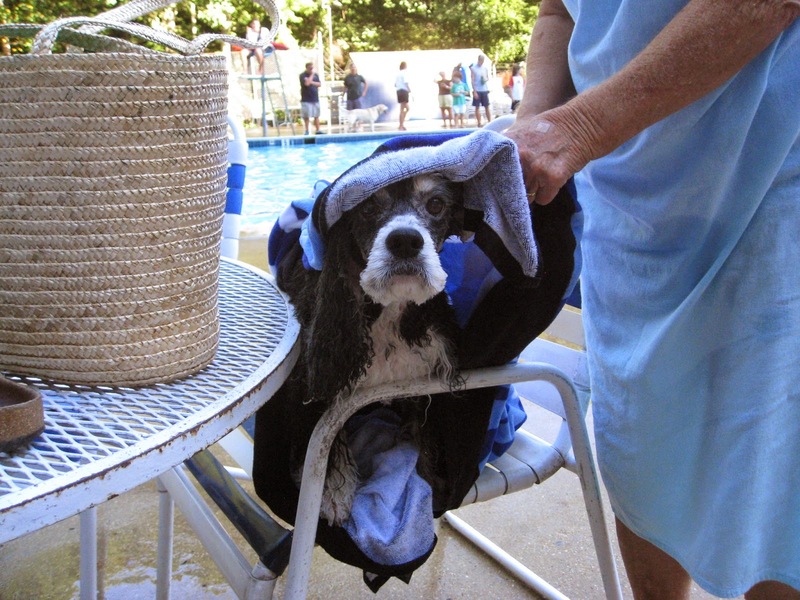 But today was the day of the dog swim. Gregg, Ray, and I stopped by to get Deborah, (photo in this blog, here), Halle's* grandma, who had agreed to video the event for us. Ray thought nothing of Deborah joining us, she often will drop everything for an impromptu walk around the block. But when we got to the corner and all of us crossed the street instead of turning towards home, Ray knew something was up. 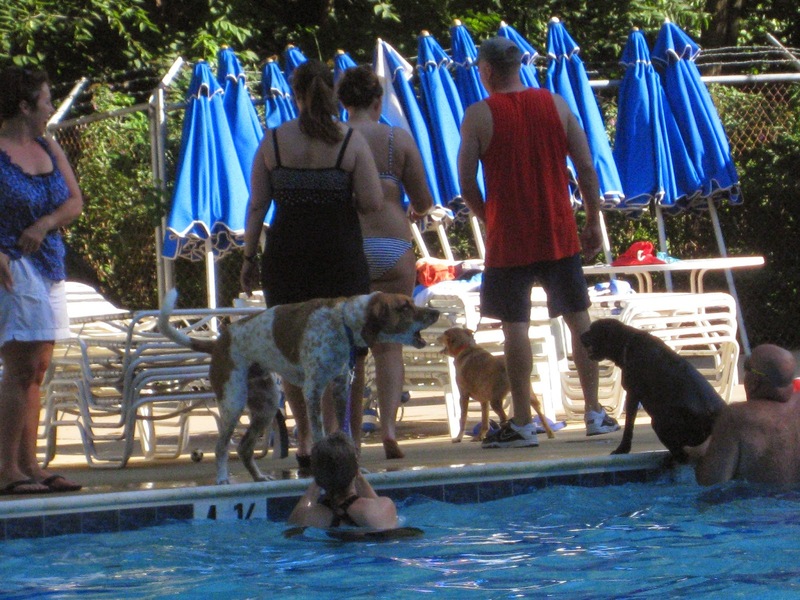 People and dogs were streaming towards the pool. Ray, who is usually pretty well-behaved on his retractable leash, spent the last half block rushing to the end of his restraint and lunging, then waiting for us to take a few steps, then rushing and lunging. He was crazy excited. 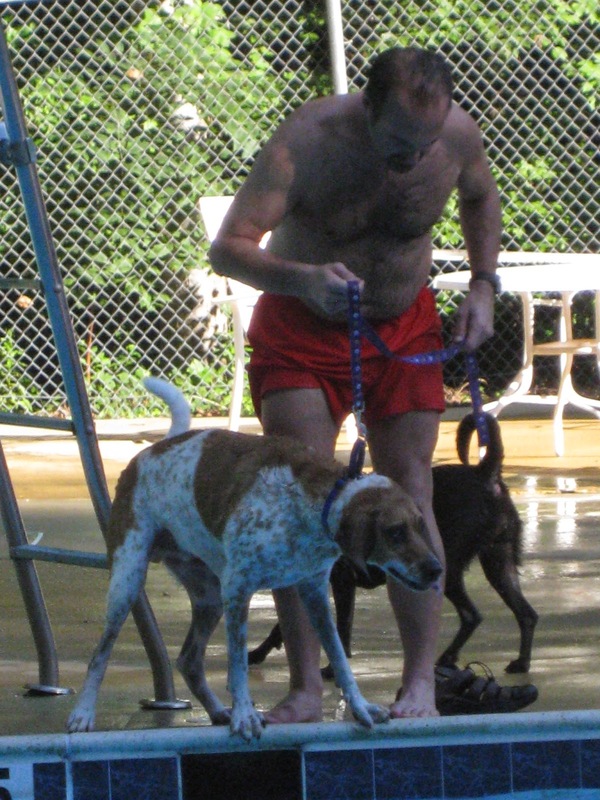 It was the perfect day for a dog swim, into the 90s (32°C) and humid, so there were more participants than usual. Ray was greeting his friends and weaving back and forth in sensory overload. He let loose with a couple of preliminary yells but was mostly quiet, saving his voice for the coming attraction. The gate to the pool opened. People and dogs streamed in. Ray made it as far as the pool deck before excitement got the better of him and he started yelling. We walked to the far end of the pool. 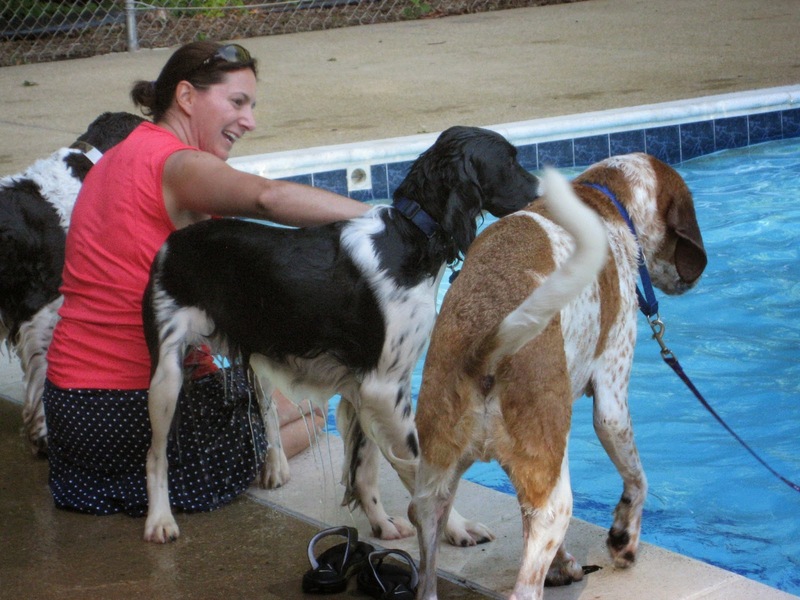 Bert and Ernie, Ray's Springer Spaniel friends, were already springing, and Maddie, our Cocker Spaniel neighbor, was genteelly paddling about. We kept Ray on a leash the entire time to keep him from swimming into people, dogs, and the side of the pool and also to steer him away from the deep end. 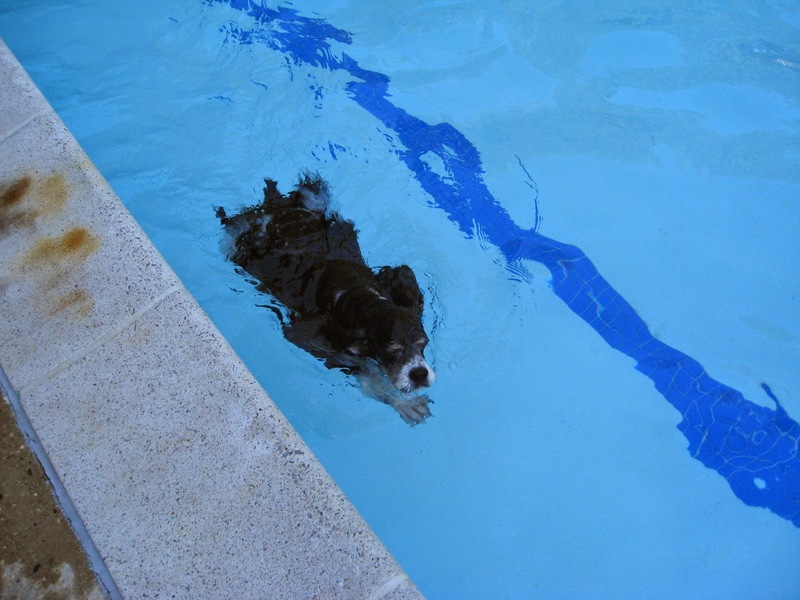 I found out pretty quickly that I couldn't haul a 75 pound (34kg) dog out of the pool without a firm surface to stand on or without the assistance of my lovely husband. *I was reading old postings about Ray's Greyhound girlfriend, Halle. We really miss her. All photos courtesy of Maddie's dad. I'm pretty sure I won that heat. Thanks, Jez. Glad you approve! Love Ray's "let's SWIM" pic. He could also be calling for a game of Red Rover. Can't wait for the video. My name is Ray the Blind Dog. 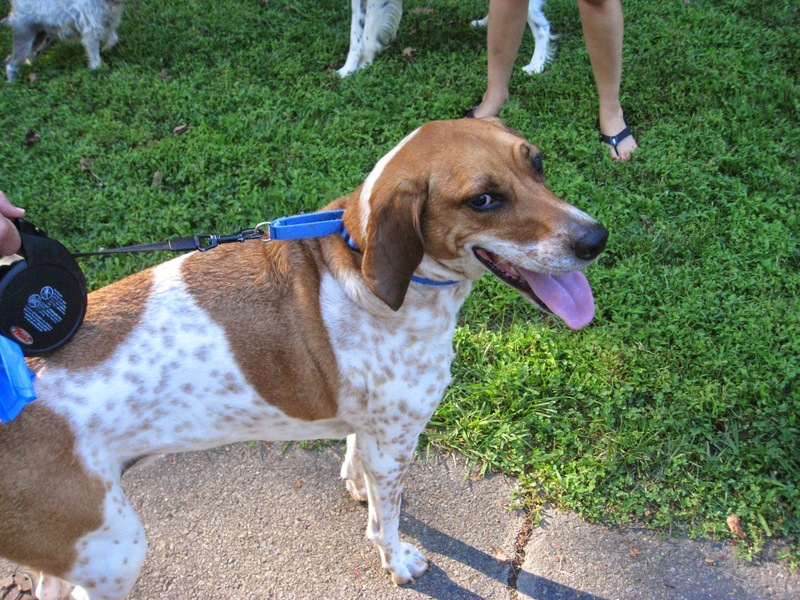 I'm a Redtick Coonhound that was born blind in July 2008. I'm named after my blind counterpart Ray Charles. 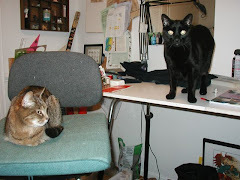 I joined a family of 2 cats and 2 humans in June of 2009. I want to show everyone how well I get along in this world and let my friends know how I'm doing. Please feel free to add remarks or share your experiences in the comment box. We all want to know what you think.